Did you think DreamWorks Animation would fumble the ball with How to Train Your Dragon 2? The first movie was a smash success, arguably the best animated film of 2010 over Pixar's praised Toy Story 3. At the very least, it was an extremely close race for supremacy, and loads of anticipation fell in the sequel's court as soon as it was announced. The time has come, and though the sequel couldn't possibly have brought the surprise or wow factor of its predecessor, it brings so much more that makes up for it. There's laughs, thrills, and heart of all shapes and sizes. It doesn't rest on just being a kiddie-pleaser and instead brings top-notch storytelling together with impeccable animation that only seems to be getting better and better. 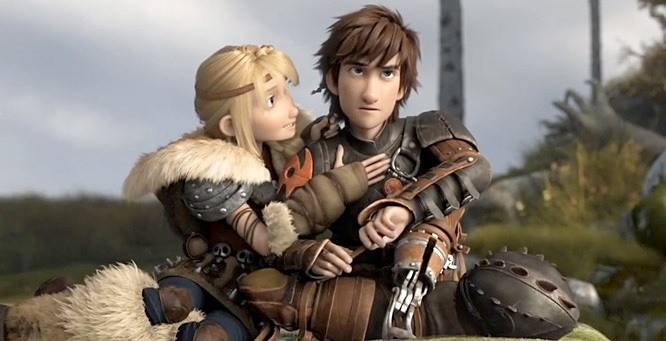 They do have to please those kiddies, though, as well as fans of the previous film, so it's back into action for Hiccup (voiced by Jay Baruchel), son of the Viking chief in his village of Berk (voiced by Gerard Butler), and his lovable, adorable dragon, Toothless. 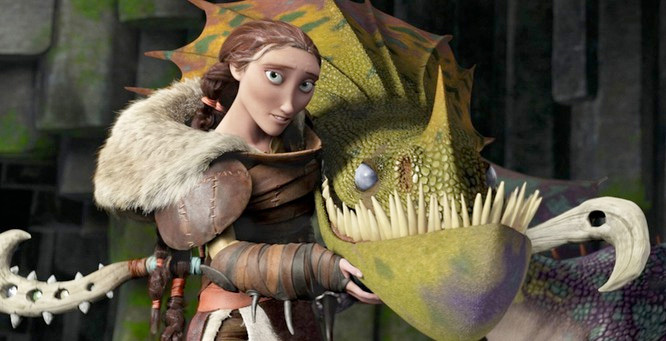 Life has changed quite a bit in Berk since last we saw Hiccup and Toothless. The newfound friendship and respect the Vikings have with the dragons have made the once-feared creatures important members of the community. Hiccup, still seeking out adventure and broadening his horizons much to the dismay of his father, ventures to the world outside of Berk, plotting maps as he goes and generally having a soaring good time with his new best friend. But the teenaged boy and dragon's latest adventure will lead them to others in the world who have "trained" dragons in their own way. A mysterious, lone dragon rider as well as an army led by a notorious dragon hunter are on the menu for excitement and adventure, neither of which bother letting up for large portions of the film. Dean DeBlois returns to writing and directing duties on How to Train Your Dragon 2, this time flying solo in both roles. Regardless of how much magic he injected into the original film, he's clearly a storyteller who has the recipe for first-rate delight in this fantastical, Viking world down pat. All the relationships here are strong, not just the one at the heart of this "boy and his dragon" story. Hiccup and Toothless' bond has never been stronger, but it's the supplementary characters, their respective place in the world, and how that changes everything that make it such a believable universe. The strength in those bonds is what How to Train Your Dragon 2 uses to pull on the emotional chords at all the right moments. The identity of that mysterious dragon rider has a major impact on the direction of this series. Though it's been revealed in the trailers, it's better left experienced within the context of the film rather than explained here. However, the way DeBlois writes for his characters and the reactions he gives each of them are more emotionally draining than the previous. If anything, the genuine drama this time around trumps both the comedy and the action on display here. Both of these aspects are utilized well in How to Train Your Dragon 2. DeBlois gives most of the secondary characters at least two or three laugh-out-loud moments, and Toothless is so puppy-dog adorable that even his hidden jokes in the background make nearly every scene in the film worthwhile. The action sweeps through the film at every turn, drawing more and more excitement as the story unfolds. The villain of the piece, Drago Bludvist (voiced by Djimon Hounsou), is unfortunately not that threatening of a presence. Sure, he has hundreds of dragons at his beck and call, and that war cry Hounsou blasts out time and time again could go a long way in soiling a few pair of pants if confronted in the real world. The fact that he's only mentioned and not seen until the film's halfway mark is deflating when it comes time for him to be the villain of the piece. Even then, his dragons are far more menacing. Hounsou is joined by Cate Blanchett as new voice talents to the franchise. While they give equally strong performances through voice, Blanchett's is the far more interesting character, part of that "drama over action" sensibility the film takes on. Her voice, however, has a way of draining the viewer of their emotion. One particular scene between her character and Butler's Viking chief is among the most powerful recently seen in animated film, even, dare I say, more so than anything found in the first How to Train Your Dragon. Those are strong words when it's taken into account that there didn't seem to be room for improvement. How to Train Your Dragon 2 isn't necessarily a better film than the original. They both have merits that succeed better than in the other film. Besides the stronger emotional high-points, it's easy to notice the improvement on computer animation from one film to the next. When you're not bursting with laughter at Toothless acting cute, you're blown away by the attention to detail in bringing him to life this time around. Those same animators are only going to get better, the technology only improving in kind. How to Train Your Dragon 2 looks magical, it feels magical, and it takes great strides in bumping DreamWorks Animation closer to the top of the animated feature mountain. I think they could have been a bit more creative with the title.